You'll be £16.99 closer to your next £10.00 credit when you purchase Nelson's Battles. What's this? Order within the next 11 minutes to get your order processed the next working day! Horatio Nelson was a hero from the time when his dramatic initiative won the battle of St Vincent in 1797, while his last battle, at Trafalgar, reduced the enemy naval forces so thoroughly that they were no longer able to have any bearing on the outcome of the war. As well as being a brilliant study of those naval battles which played such an important role in Napoleon's defeat, it also makes a close study of the admiral's art which, during the last years of the eighteenth century, developed faster than at any time since the previous century and led to Britain's mastery of the seas for more than 100 years. The Seven Years War and the War of the American Revolution stimulated the development of new ideas and the experience gained from them, as well as the developments in ship design and signalling, and the perfection of drill, transformed naval methods. Nelson became a master of them all. This technical prowess, combined with a remarkable ability to lead his men and his genius for making decisive moves, 'the Nelson touch', made him the consummate master of naval warfare. Highly readable, concise and insightful, this new edition will prove a popular choice for those seeking an introduction to naval warfare in the age of sail. This well written book considers not only the battles but also the great admiral himself, and with sympathetic descriptions of his captains and their crews, makes for interesting reading. Those interested in naval history have much to thank Nicholas Tracey for. Few historians can have a greater knowledge of sailing, naval tactics and the events in the Revolutionary and Napoleonic Wars. 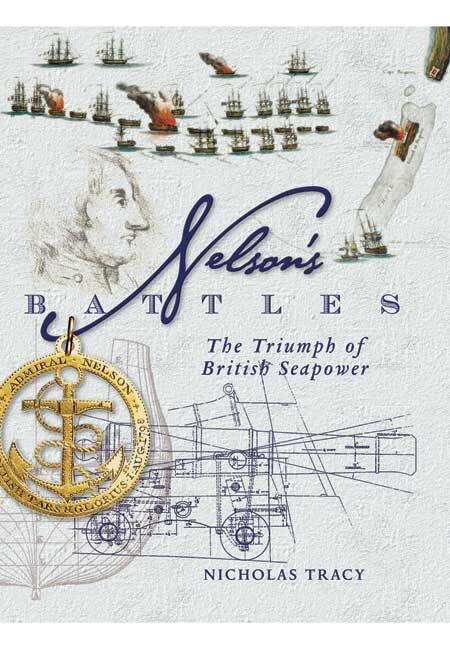 Nelson's Battles is an updated version of the book he published in 1996 incorporating subsequently discovered material, in particular, Nelson's fascinating tactical Trafalgar sketch discovered by Colin White in the British Library. Four of the five chapters are specifically devoted to Nelson's Battles, his professionalism and leadership, and not surprisingly, the tactics involved. Whilst the narrative broadly follows well trodden paths, it is written with authority. However the fifth, the most interesting and longest chapter makes a valuable contribution to the understanding of British naval philosophy and its implementation over the sailing navy years. It offers detailed explanations of the many aspects that comprise trade protection and power projection, and the art and development of tactics and signals as successive admirals amended, and improved, the fighting instructions continually adding additional signals until Home Pop-ham devised his master system which was used at Trafalgar making possible the most famous of all naval signals. If nothing else, this chapter is worth the price of the book and I cannot wait to read it again.